Choice of 110V or 220V. Choice of 1-1/2" or 2" chain-set. This mortiser is best used for in-the-field repairs, or for private builders. The Swiss KSL 161 cuts mortises against the grain, like its professional cousin, the SwissPro KSP-16. Cross-grain mortising is rapid, saving time, leaving a cleaner mortise and perfect, perpendicular mortise ends, needing much less chiseling. The machine glides easily without clogging shafts or bushings. With the new, more powerful Swiss-made "Suhner" motor, the machine is now available for 110V operation, with option for 220V. Good chip ejection with safety guard on. 6" cutting depth at 18 mm (~3/4") width. 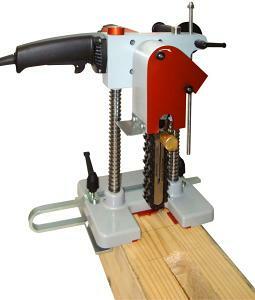 Machine includes a mortise chain-set of 1-1/2" or 2". Specify when ordering. To purchase additional chain-sets, see Mortise Chains .